Chef Eckman grew up in western PA, the youngest of six kids. As part of a big family, he often found himself alongside his mom in the kitchen helping prepare large family meals. He spent weekends at his family’s farm where he helped maintain cattle, chicken and harvest fruits and vegetables. 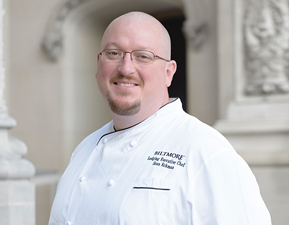 These childhood moments and memories influenced his decision to become a chef and specifically join Biltmore. A self-proclaimed “farm boy” at heart, Chef Eckman views his role at Biltmore as the ultimate opportunity to connect to the land and provide amazing culinary experiences for families to come together in a beautiful setting and celebrate life’s milestones. Chef Eckman joins us most recently from the 5-Star/ 5-Diamond Nemacolin Woodlands Resort in Farmington, PA. During his eight years of service with Nemacolin Woodlands Resort, Sean was the Chef de Cuisine of the FORBES 4 Star Aqueous restaurant and also the Executive Sous Chef of the FORBES 5 Star Lautrec restaurant. He progressed to the Executive Chef of the resort which was responsible for all twelve food and beverage outlets. Prior to working with the Nemacolin Woodlands Resort, Sean worked for eight years at The Breakers Hotel in Palm Beach, Florida. He completed his externship program with The Breakers and was the first extern ever to be hired into their coveted L’Escalier fine dining restaurant. Chef Eckman holds a degree of Culinary Arts from Indiana University of Pennsylvania Academy of Culinary Arts. He has designed and executed dinners for numerous prestigious events including the James Beard House in NYC and various La Chaine des Rotisseurs events.